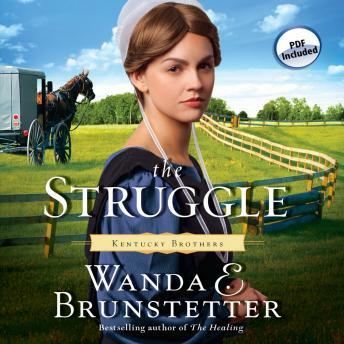 Listen to "The Struggle" on your iOS and Android device. Can a couple rent by grief find renewal? Timothy Fisher’s decision to move his family from their home in Lancaster County, Pennsylvania, isn’t a happy one for his wife, Hannah. Everything she knows is in Lancaster County—her mother, her home, her friends. But what choice does Hannah have? Realizing that her place is with her husband and young daughter, she reluctantly goes—but her new life is a hard adjustment. Nothing Timothy does pleases Hannah, and his best-laid plans are beginning to crumble before him. Then a tragic accident occurs, further driving a rift in their strained relationship. Hannah is inconsolable and blames Timothy. Between the stress of his job, dealing with his wife’s hostility, and feeling the burden of guilt, Timothy can barely cope. Hannah’s resentment drives her back to Pennsylvania, where she hopes to find peace and healing for her troubled soul. Timothy turns to his pillar of strength and pleads with God to restore his marriage. Amid the ashes of grief and struggle, will renewed love, faith, and hope emerge? what a wonderful gut book this was, full of little twist and turn and I did not want to stop listening afraid I would miss what was coming next.